Julian Cantu, 4, of Edinburg is all smiles during the Super Heroes event at DHR Childrens Hospital on Thursday, Sept. 2, 2018, in Edinburg. EDINBURG — A slice of pizza hung from Julian Cantu’s mouth as the nurse readied his monthly chemo dose. He’d “entered maintenance,” said his mom Julia Jimenez of Edinburg, which means his cancer treatment transitioned to a preventative, outpatient procedure. Before, he’d spend days in this Health Pediatric oncology wing for treatment at Doctors Hospital at Renaissance. The nurse connected to the implanted port on his chest from under his Marvel comic pajamas. He was dressed for the theme party Wednesday as patients, parents, staff and volunteers of Children’s Center at Renaissance gathered in the playroom to greet local law enforcement. Batman and Ironman were lifted to the window outside the fourth floor atop a fire engine bucket. Superheroes took pictures with each other after the dramatic entrance. Officers placed sticker badges on kids, as parents, staff, volunteers and media gathered Thursday as the Edinburg Police and Fire Departments honored kids fighting this life-threatening disease. The inaugural event was in honor of Childhood Cancer Awareness Month and in partnership with the Vannie E. Cook Cancer Foundation. 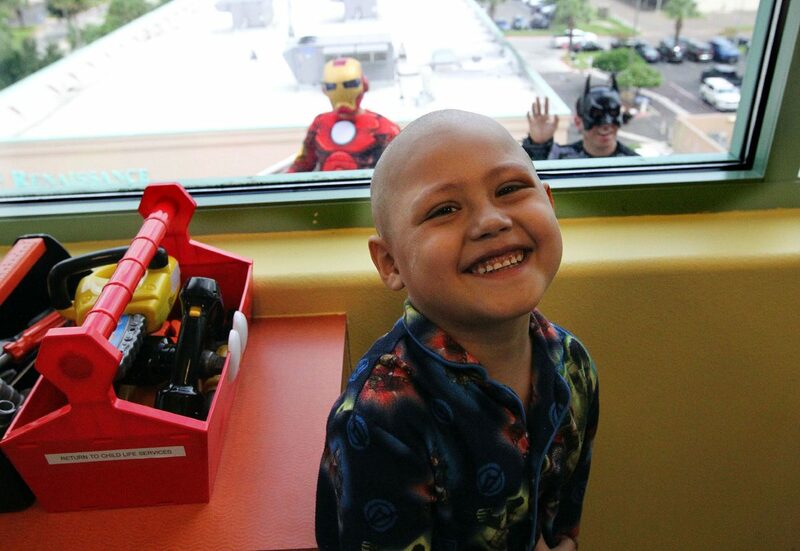 The clinic works with local hospitals, like DHR, to provide local cancer treatment for kids. Before, children and parents would travel hours north, adding expense and other logistical obstacles. La Villa resident Marissa Hinojosa said she appreciated the work of the local doctors, nurses and everyone that treats her 5-year-old daughter Alyssa. She was dressed as Wonder Woman. “‘Mom, I want it to be morning already so I can put it on,’” Hinojosa recalled Alyssa saying the night before. “She was really excited. Ponce said it was a priority for community-oriented policing to celebrate these kids and families. Families with children facing a life-changing fight against cancer are often overwhelmed, they say, and support through events like this let them know they’re not alone, according to Julian’s mom Julia Jimenez of Edinburg. Families and kids fighting find strength and inspiration in each other, she said.